We must preface any discussion concerning agency budgets and fiscal implications by first saying the greatest cost of wildfires is personal injury and the loss of human life. While this risk may be a reality which is routinely accepted by those who have dedicated their professional careers to such endeavors, it is not one which should ever be taken for granted by any American, even those who do not spend time in these special places. Word came earlier in the week that 18 Michigan Department of Natural Resources-trained firefighters have been sent to aid in fire suppression efforts in western Montana. This support is part of a national cooperative agreement which last year saw assistance come to Michigan in response to the upper peninsula’s Duck Lake fire. Although Michigan is likely to be fully reimbursed for its support of these western wildfire efforts, the United States Forest Service (USFS) is not so lucky. The estimated 32,000 fires which have burned some 3.4 million acres this season has once again required the diversion of funds intended for timber, habitat management and recreation to supplement the $1 billion which has already been spent fighting fires this year. Although the day-to-day management of most USFS field offices found here in northern Michigan is unlikely to be discernibly impacted, those of us who continue to seek recreational improvements and better stewardship of our national forest lands will once again need to wait. 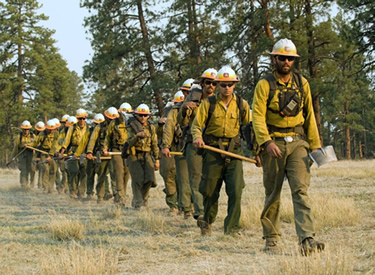 Costs of fire suppression now represent nearly one-half of the USFS total budget. This, as compared to fiscal year 1991 when such activities represented only 13 percent of its budgetary total. Since fiscal year 2000, the 10-year average cost has risen almost every year – from just over $540 million to more than $1 billion in 2010 and beyond. The “Catch 22” of the situation is this. The more money needed for response to wildfires, the fewer the resources available to pursue hazardous wildfire “fuel” reduction projects. Timber harvest trends on federal lands now stand at some 2 billion board feet annually as compared to 12 billion in the late 1980’s. Given the millions of acres of diseased, dead and dying timber which have been added to this fuel inventory, now would seem to be a good time to stop pretending that this trend is an aberration and work toward more realistic long term solutions. This is also one of those rare opportunities where those in the business, timber production, outdoor recreation, wildlife and conservation communities would seem to have more in common than not. In other words, a good time for another rare commodity known as bi-partisan leadership.